After decade of waiting, Tesla has revealed the Model 3. At the unveiling of the Model 3 this evening at the company's design studio in Hawthorne, California, Tesla CEO Elon Musk said the car will deliver at least 215 miles of range beginning at just $35,000 — that's a bold claim, and an important one for Tesla to meet. Musk is "fairly confident" that deliveries will begin by the end of 2017, and "you will not be able to buy a better car at the cost of $35,000, even with no options." And it will be one of the safest cars in the world, according to Musk. Tesla says more than 130,000 pre orders — buyers need to put $1,000 down — have been placed, and that number will continue to rise. The base car will hit 0-60 mph in less than 6 seconds, with versions that go "much faster." 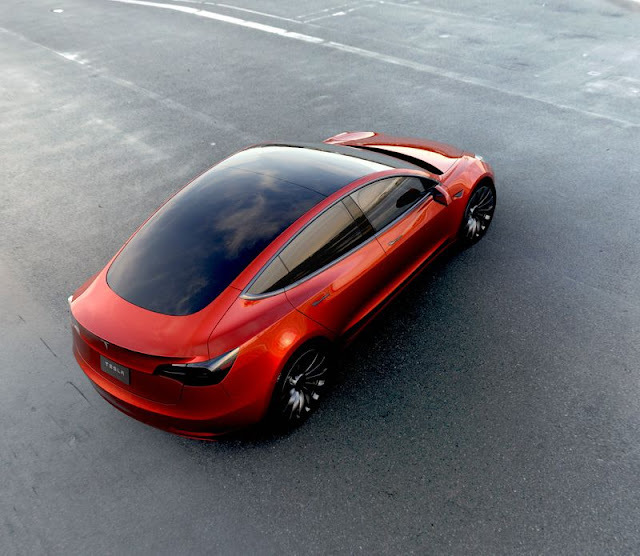 Range will be at least 215 miles, but Tesla hopes to exceed those numbers in the final car. All Model 3 cars will include support for Tesla's high-speed Supercharging network, because "it's about going where you want to go," according to Musk. By the end of 2017, when the Model 3 launches, Tesla says it will have a total of 7,200 Superchargers, double the number available today. 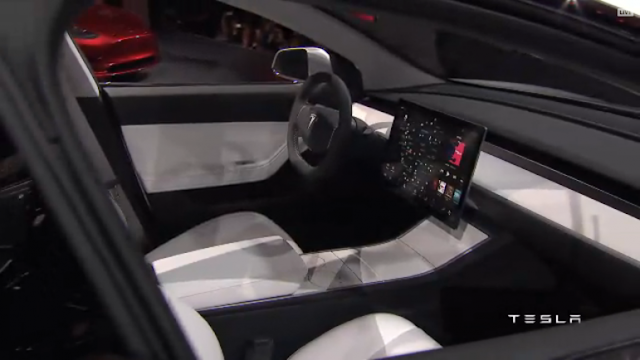 Like the Model S, the Model 3 will come in both rear-wheel drive and all-wheel drive versions, and there's a 15-inch landscape touch screen inside — an interesting change from the 17-inch portrait touch screen in the Model S and X. Autopilot hardware is standard, and all safety features will be active automatically. Five adults will fit comfortably — "comfortably is the important part here," says Musk. any gasoline car of the same external dimensions," says Musk. You can even fit a 7-foot long surfboard on the inside. The two current Tesla vehicles, the Model S and Model X, are both extremely expensive. Even with tax incentives, both cars easily push $100,000. In order for Tesla to sell ten times as many cars as it does now, it needs a much cheaper automobile. That's the Model 3. It's the future of the company. But don't expect to get your hands on one any time soon. The Model 3 isn't expected to begin production until late 2017, more than 18 months from now. Tesla will happily take your preorder for a modest $1,000 down payment. Tesla plans to more than double the size of its dealership and service network by the end of next year, to sell and take care of all these new cars. For comparison, the biggest direct competitor for the Model 3 is the Chevy Bolt. GM says that car will have an electric range greater than 200 miles and a price, after tax incentives, of around $30,000. Tesla recognize that everyone wants to get their Model 3 as quickly as possible. Their overarching goal is to maximize total customer happiness within the bounds of what is physically possible.